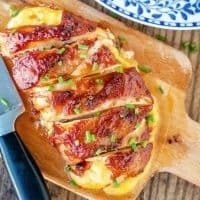 Bacon wrapped chicken slathered with sticky BBQ sauce and stuffed with gooey, melted cheese is an easy dinner idea that will have everyone begging for seconds!! For this Bacon Wrapped Chicken recipe, Real Housemoms cooks the Bacon partially at a higher temperature before wrapping it around the chicken. Therefore, when it’s time to bake, the chicken comes out of the oven perfectly moist with crispy bacon wrapped around it.